Huan K'uan. Debate on Salt and Iron (Yen ti'eh lun). [Хуань Куань. Спор о соли и железе (Янь те лунь)]. In 2 vol. Tr. 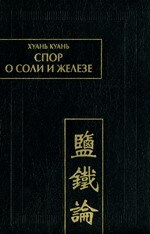 from Chinese, with introduction, notes and appendices by Yu.L.Kroll. Moscow, Vostochnaya Literatura Publishers 2001. 407 p. (Pamyatniki pismennosti Vostoka. СХХV, 1). On January 29, 2018, at the meeting of the Academic Council of the IOM RAS, Dr. S.M. Prozorov will submit his lecture 20 years anniversary of the 1st edition of the encyclopedic dictionary 'Islam in the Territory of the Former Russian Empire'.